With each new year, comes a new set of hopes and dreams. And in my case, a whole slew of projects that I hope to accomplish! There are inner journeys to contemplate, leaps of faith, new scriptures to learn and meditate upon and not nearly enough hours in a day or days in a year to accomplish all of them! But I've also learned in the past, that how high one sets the bar determines what one will achieve! 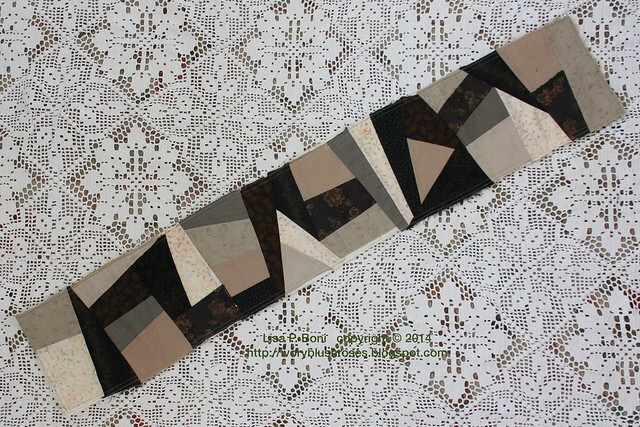 So first, a look at the handwork (Crazy Quilting) projects I have lined up for this year. 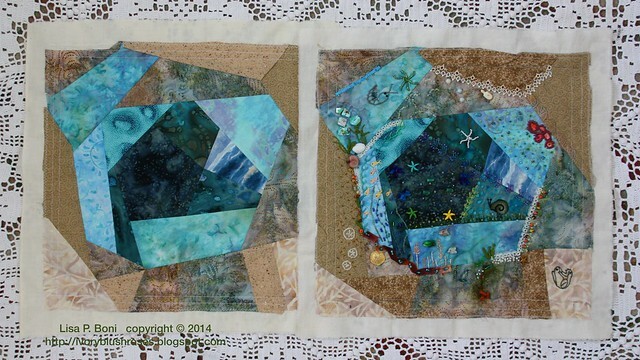 First up is my main set of CQJP 2015 blocks which I hope to fill with beautiful stitching! They are a challenge because of the colors, which are outside of my comfort zone and because the stitching will force me to think beyond the seam. My antidote CQJP Blocks are these two sets. The green set will be filled with florals in shades of green, white, soft pinks, blues and lavender. The linen set will feature greenery and embroidered birds. I hope to not only stitch one of my Yellow/Orange blocks each month but also one of either the green or linen blocks each month as well. Yep, that will be two CQJP blocks each month! 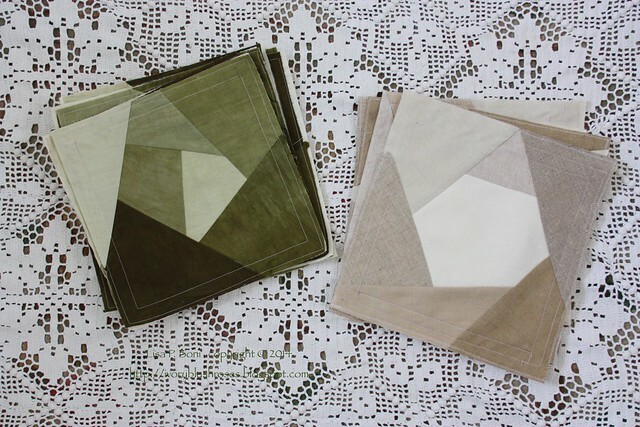 Since I hadn't yet shown you the linen blocks, here is a peek at them! I'm starting with four, but if they go well, may add to them. I am participating in two round robins at the moment. Steam Punk and a Mini DYB. I will complete one block in each round robin every month (through April). Depending on how well I am able to keep up with stitching all these blocks every month, I may sign up for another round robin to start in the spring. So, two CQJP blocks a month plus two round robin blocks a month - now we are up to four blocks a month. The following projects are all leftovers from years gone by. Most have been on my "to do" list for the past couple of years, but I haven't been very good about working on them and getting them finished. Something I hope to change this year. My goal is to finish one of each of these every month this year. A couple of the larger ones may carry over an extra month or two. First up are the tiebacks for my sewing room curtains. 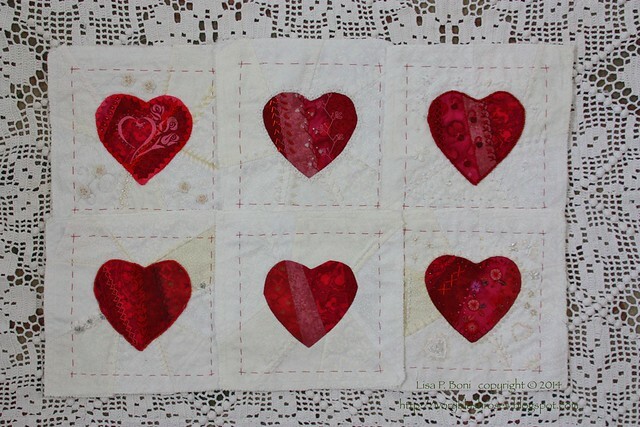 I'd like to make three more of these heart blocks and make a small wall hanging! I'm about halfway done stitching the lower middle one. This was an Encrusted Round Robin that has been lingering at the bottom of my basket for a long time. I love the arbor that Gerry K made and all the wonderful ribbon roses on these blocks. I'd like to finish my block with more roses and turn this into a bell pull to hang in my kitchen. 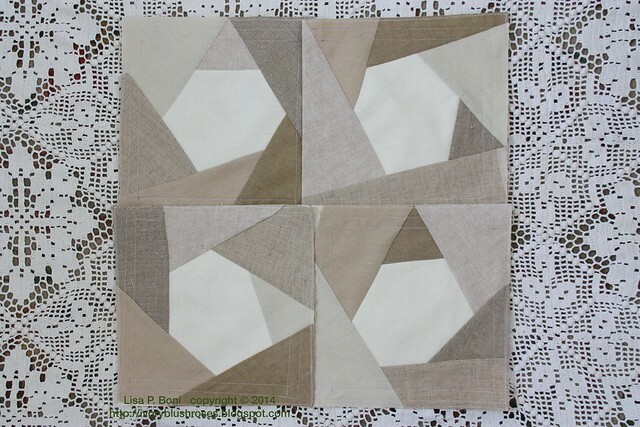 Love these blocks and am excited to see the last block that still needs to come home on this round robin. Then I'll finish my block to coordinate with the rest and turn this into a bell pull as well. Another round robin that I just loved was this Autumn group. 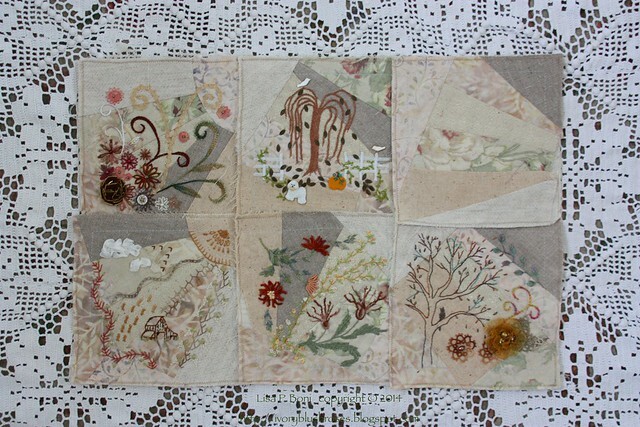 I'll stitch the empty block with a floral/leafy motif to balance the group. This will make yet another bell pull! I have the perfect little wall in my kitchen to display bell pulls and eventually would love to have a wide assortment to change out monthly! This set of round robin blocks intimidates me for some reason! When I made the shell pattern, I thought I would make a book from them with the hinge side of the shell being the hinge of the book. But when someone asked what the top should be, I wasn't thinking and said it didn't matter, so they all ended up being the wrong direction for my initial vision. 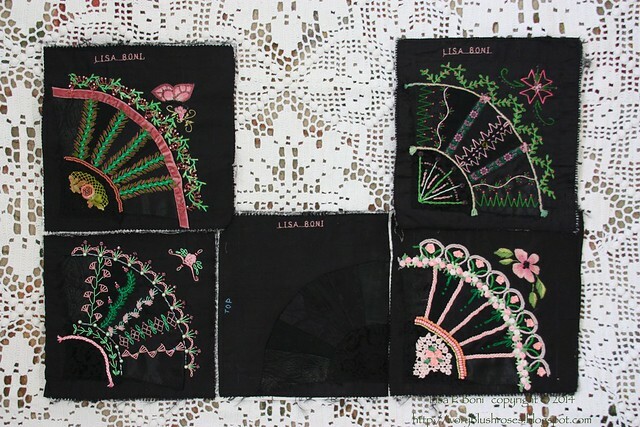 Now I'd like to finish them up and make then into an accordion book that can stand up on mantel for the summer season. 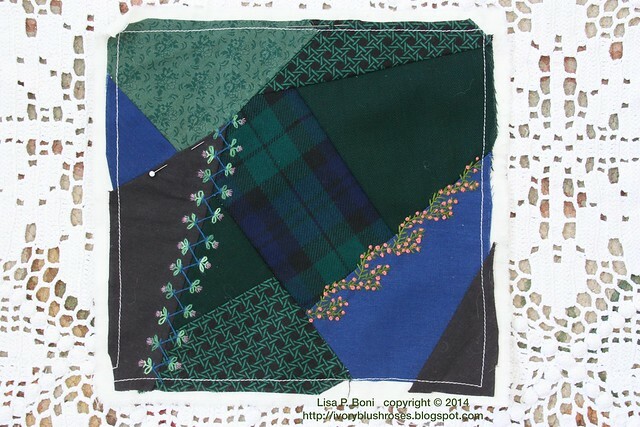 I started this little Scottish themed block when I first started crazy quilting, but then got stumped as to what to do next. Then I got distracted by other projects. I'd really like to finish this and now have loads of ideas what to do with it! I think I'll turn it into a box top eventually. This moonlit fairy block will end up being a framed piece. I have such a vision of this block in my head that I'm almost scared to work on it for fear of messing it up. It is time to get beyond that fear and just stitch! 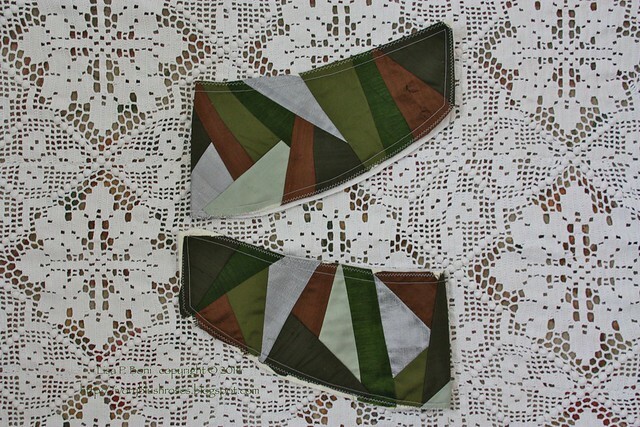 I made this piece originally thinking it would be a table runner. But it's far too small, especially for the huge tables that both my sister and I have. Instead, it's just perfect for a bell pull. I'd like to use this to experiment with new stitches or seam treatments on throughout the year. Hopefully at the end of the year it will be filled with stitching and ready to turn into that bell pull! This is one of my blocks from the Steampunk round robin. Our group only has 5 people, so I kept one block behind to work on at home as time allowed. There will be another block to work on once they all come home. These will get made into a small wall hanging for my daughter who LOVES steampunk! This last set of two blocks is a personal challenge that I set for myself. 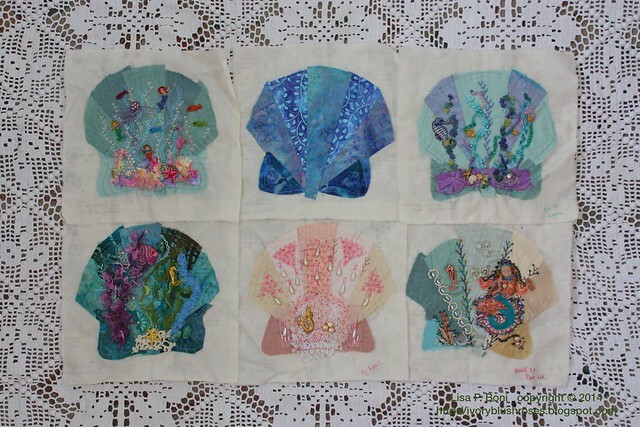 Last year, the block on the right was sent out in an Under the Sea round robin. It was a real challenge to the participants. The stitching they did was lovely, and there are many wonderful delights on the block, but it could have been so much more! 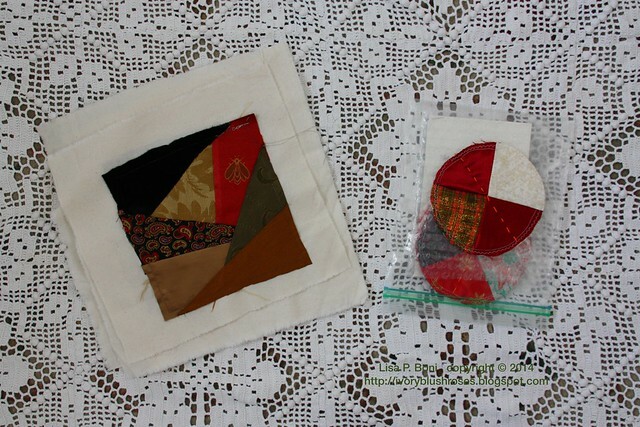 I want to stitch the new block on the left in order to show what could have been done with the block. There are a few more things in my "to do" basket, but the ones I've shown are the ones I really want to get completed! So yes, you've read correctly. My goal is to stitch FIVE (5) blocks a month! Goodness! Not giving myself much room for slack here. I may have to amend this goal, but I know at least one thing that might help! I have a few personal goals as well this year. - I would love to increase my social circle as it is too easy for me to be a hermit, staying at home and stitching all the time or working on art projects. And I think that after 20 years of being divorced and single, I'm actually ready to consider dating again. Yikes! In truth, I'm clueless about how to go about either! Say a prayer for me! - I have two big trips coming up this year! 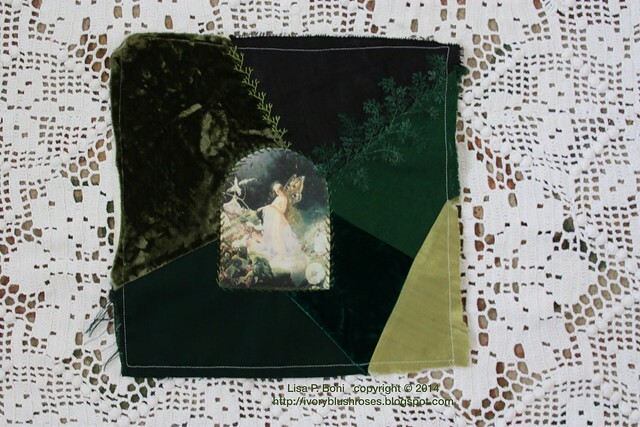 * Trip in April to New Jersey/New York for the Slow Stitching Retreat and to visit with family and friends! * Trip in September to the Netherlands with my sister for the CQI retreat and to see the sights and visit some extended family there! - I really want to paint more this year. I've missed my sketchbook and my oils and it was disappointing to see how little I had done last year! not one of them in broken. Wishing you a blessed, wonderful year in 2015 filled with amazing adventures and lovely creativity! You too have a wonderful, fun filled 2015 Lisa. P:4/8 is good one to have around for the whole year, posted to read whenever. I love you find these verses and incorporate them with all you do. Your projects look exciting will look forward to see them evolve! Happy wishes to you for 2015! You're going to be busy with all you have planned - it will be fun to watch it all evolve through your blog. Oh my, you have a lot on your creative plate for this year! I am inspired once again by all that you do. I am very excited about your projects! That means more of your beautiful stitching to drool over. You have I inspired me also. 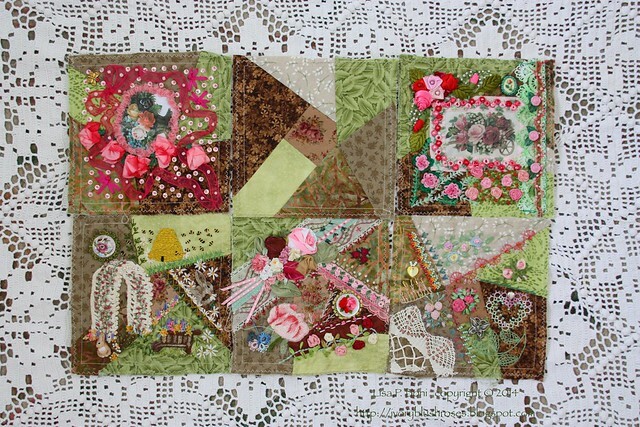 I have always loved the idea of crazy quilting but thought I needed a huge variety of sumptuous fabrics to do one. 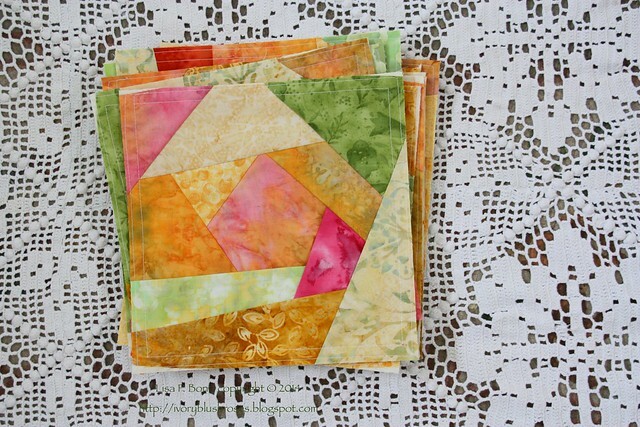 I see your beautiful batik pieced blocks, and those amazing pincushions you made, and think I might have to collect some more batiks and give it a go! Love that you've set the bar high for yourself. I need to do that more often. And I LOVE the colors for the CQJP2015 adventure. I can't wait to see what you do with all your projects. Truly ambitious stitching goals for the year! All the best to you in the coming year. I hope it's a wonderful, creative, friend and family filled year. <3 H.
You have some wonderful work ahead of you. I missed the Steampunk signup at the retreat and waiting to see what you gals come up with. A Happy New Year and good health to you. Maybe some romance too? OH boy. 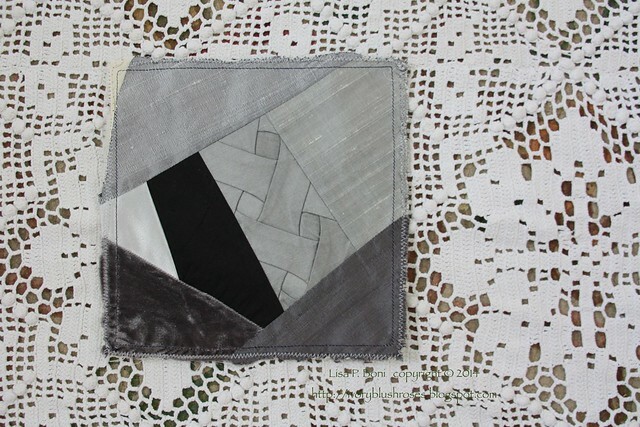 Email me about the Slow Stitching Retreat. It's a bit expensive for me this year but I would so love to hang with you. I hope you will paint more this year. I still have a dream that you will publish a hand drawn and painted crazy quilt seam book...I would buy it in a heart beat!!!!!! !